It is cold here in Michigan, 1 degrees with a wind chill of minus 15. Wind is blowing at 36 miles an hour. Oh dear. I’m so layered up, it’s not funny. I have three layers on top and a blanket around my lap. House temp is set at 68 so I can keep my heating bills low. Had a very creative day yesterday. A girl friend who specializes in ceramics – she is also a master gardener, came over to learn how to do painterly monoprints from me. She’s been working on a project or series in her mind with various perennials. In addition to japanese wood block printing (I would like to learn to do that as well), she makes tiles of perennial plants and now with painterly monoprints, she has another representation of her art. I lost track of time, but I think we spent over two hours. I did one of dwarf lake iris and one of wind mills from our motorcycle road trip. 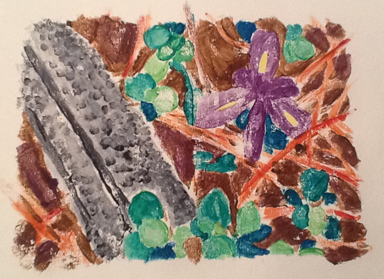 Dwarf Iris Lake Monoprint. I think I could have gone darker with the background. It would help the leaves and Iris pop. Will do it again. I’m happy how this one came out. 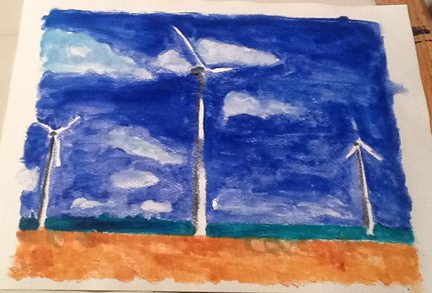 Three wind mills. I wanted to show the vastness of the sky. Today I came up with an idea of coordinating a fundraiser in the form of Ladies Night out. I posted my idea on Facebook and so far the response has been good. Now I need to put it down in form of a plan and see if I can execute it. If successful, I’ll do it again in October – maybe keep it twice a year. I have picked two local charities to support – The Rochester Neighborhood House and Paint A Miracle. I’ve picked two dates. I realized one would be during Rochester community Spring Break – that may not be good. The other date is before Easter. So, I am not sure which is good. I wanted it to be three weeks before Mother’s Day. But – lets see how it goes. I have made a list of vendors. I have to approach them. Then I need to devise the social media and grassroots promotional strategy. Am I avoiding the week three tasks that I am supposed to be doing? Yes. I really don’t want to look back into the past, into my childhood. Many of it was painful and lonely. It makes me sad. I know it has made me part of who I am. I recognize that. I rather not let define me or remind me of what could have been. I rather try to focus on now and the future. I just try to learn from the past, learn from the day and move forward, always striving. I know I am not the same person as I was ten years ago or 15 years ago. I do not intend to be the same person as I am ten years into the future. So, with that said, I am starting my grant writing class on Monday. Have ready read the four required chapters for the class. I know, I am being eager beaver. This weekend is the Fire and Ice Festival in Downtown Rochester. Lots of things going on. Fireworks, Snow Activities, Taste Fest, Food Trucks. It’s all in the spirit of Winter. I unfortunately, am not a winter person. Can’t wait for this winter to be over.